A quick post by way of a general update, since my blogging mojo has clearly deserted me – if indeed it ever visited, which seems unlikely based on the evidence. Today it appears to have popped in for a cup of tea at least, so here I am. The summer holiday has shot by, and has been incredibly busy – it seems entirely unreal that I’ll be back at my four-day-a-week school job next week, fitting in writing and editing around that and everything else which goes with running a family of five. Since we all broke up in July we’ve camped in a puddle in North Yorkshire (not on purpose – the puddle wasn’t there when we put the tent up), acted/played/sung in a play about the Russian Revolution with the Big Theatre company, and enjoyed the splendid irony of marvelling at the pinnacle of sporting endeavour in the Olympics and Paralympics while slobbing about on the sofa eating cake. I have also put the finishing touches to my book on Sussex dialect, which is due for publication in the next few weeks (the final proof should be going off to the printer any day), agreed in principle to write another in the same series, probably about Norfolk dialect, as well as a few others which may or may not be in the pipeline, and rushed out some text for a photo book on the Peak District which will be published in time for Christmas. All these have come my way via a colleague who prefers not to be named in thanks and acknowledgements, but who nevertheless brokers deals with publishers and then shoves them my way. I am extremely grateful for all his efforts. I have had word that the Wandering Weeds anthology, featuring a short story of mine, will also be making an appearance pretty soon – I’m glad about this, because I had almost given up on that little story ever appearing in the wild. I know Jaleta and Frances have both worked really hard on the antho, so I’m looking forward to it coming out. In between all this I’ve edited reports, articles, book chapters and a novel, and have just started work on a second novel for the same client. After a tremendously busy period in July, when I was working on three or four (and for a short but memorable period, five) separate editing jobs at once, the freelance work has thankfully levelled off to a steady and manageable rate. I have a few long manuscripts booked in between now and Christmas, with plenty of scope for fitting shorter contracts around them and also for working on my own writing. Good times! 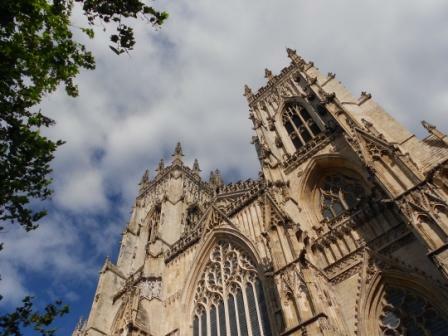 Finally, and apropos of nothing in particular except to prove that it didn’t rain all the time we were in Yorkshire, here’s a picture of York Minster. I’ve been playing with my (still fairly new-to-me) camera, but most of the other shots I’ve taken seem to feature my children gurning. Delightful. This entry was posted in editing, freelancing, holidays, publication, writing. I’m tempted to just reply with a big grin: I love seeing your posts, love that photo of York Minster, miss England with two passions, and am very happy you’re so busy with editing. One day we need to sit down and discuss how you do this because I need that much work too. And I’m actually not joking! I’ve had from five to two projects on the go since April or so, and yesterday I finished the last one I was working on. I breathed deeply, appreciatively, for the first time in ages, and promptly panicked. I can use this time to review, write, read. It’s lovely! But it’s not billable…. I’m so happy for you about all these writing projects you have too, and I would love to see that Peak District book, of course! Lastly, I’m glad things are back to a more normal rather than frenetic pace. And I want to read that Wandering Weeds story. The concept of the site is wacky and hilarious.